Rick's Art Studio was founded in 2004. It is owned and operated by Richard Yanke (Rick) right here in Madison, WI. The primary purpose of my creating art is to give the viewer a recreation of a moment, a time, a feeling. I love to do paintings from your favorite photos. There are many artists that offer this as a service. I'm convinced you'll think the time and good energy put into my projects shows. Rick Yanke was born in 1963 and raised on the east side of Madison Wisconsin where he still resides today. The inspiration for Rick’s landscapes stems from his fondness for and deep connection to the Madison area. As he retraces the steps of his boyhood adventures around the city and its surrounding areas, exploring, looking, and remembering, he never fails to find a magical spot to set up his easel and recreate memories that not only belong to him but are shared by multitudes of others as well. From a very early age, Rick remembers loving to draw. Being the only child of a single, hard-working mom, he was able to spend a considerable amount of time in his room developing his skills. He grew up, finished high school, eventually married, had two children, and worked in the heating and cooling business. He still enjoyed drawing and painting occasionally when time allowed. At age 29 Rick was diagnosed with MS. He continued working until age 40 when his disability finally forced him to retire. This brought Rick back to his roots to revisit an old passion and pursue a new career as an artist. Although very early in his career as an artist, Rick enjoyed using photographs to create very realistic portraiture in graphite and colored pencil, he soon found that he was more intrigued by the many and varied contrasts in color created by natural light in an outdoor setting. After dusting off and dabbling a bit with a 40-year-old set of oil paints which had been given to him as a young boy by his mother, he decided to try his hand at painting. He joined the Dane County Plein Air Painters Association, and his work began to evolve into what it is today. A mixture of realism and impressionism with a painterly flair. The best of both worlds for him. Aside from taking a class or two at both MATC, and UW Madison, Rick is mostly a self- taught artist. He can be seen almost daily practicing and creating his personal interpretation of iconic places around town. When he is not on site, he can often be found in his home studio where he also enjoys painting portraits. 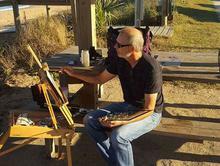 In addition to painting, Rick’s other passion is teaching. He gives private lessons in his studio and is regularly invited to teach painting and drawing classes at a local high school, encouraging and inspiring other young artists to record their memories, and follow their dreams as he has.